If you are an owner of an established business, you must be aware of the huge importance of trade shows and exhibitions for promotion and brand recognition. In case you have just started out, you need to be familiar with its significance for the growth of your business. Participating in trade fairs makes way for reaching out to a large number of customers. Your targeted customers are able to know about your brand and you are all smiles with decent profits. Success at exhibitions is dependent on how pleasantly you set up your booth. Eye-catching trade show booths are crowd-pullers. Preparing a stunning booth is not a difficult job if you plan the set-up appropriately. The plan should include the following aspects. Be sure about the goal of your booth i.e. whether you want to spread the word about your products or services or wish to generate leads. Decide on the equipment you need for effective promotion i.e. the type of displays. It is important to present your stall aesthetically. Suppose, you want to distribute leaflets or brochures only; possibilities are that many people will stay away from visiting your counter. In such situations, decorating your booth beautifully will make sure that visitors throng to your stall. You may consider customized designs. 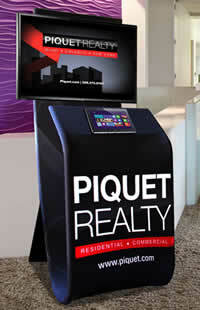 Contact a reputed and experienced booth design service provider that offers custom-made designs. Deciding on the size and shape of trade show booths is dependent on the availability of space in the venue. If your purpose is to present a product demo in an exhibition, you need to ensure that there is adequate space for customers to sit for the demo. The market is flooded with different types of marketing tools. Starting from tabletop and floor models to various modular designs, you have loads of display options to choose from as per your needs. I suggest going for a lightweight and portable display type to assemble and dismantle easily and move from one place to another without any difficulty. 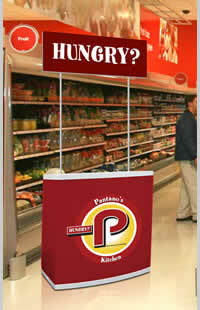 Graphics are becoming a must in designing advertising stands. If you want to include graphics, it is fine, but they should not cover up your business logo, message and contact information. Keep the graphics simple and stylish. Choose a clear font for text. A playful font somehow makes it complicated for people to read the message. When you are talking about your products or services in the display, make sure there are apt images to accompany the words. Again, the images must not be gaudy. Pay attention to the lighting in your booth. Fluorescent-style lighting may be the best option. If you feel unsure regarding decking up your booth on your own, you may hire the service of a booth design company. Talk to them about your business requirements and get yourself involved in the design process, but remember not to be dominating and extremely finicky. Opt for a booth designer company that has an extensive experience in designing trade show booths. Here’s wishing you good luck for a putting up the most attractive booth at the trade show.